Be available, says Bufka. If children have questions about school, or, once school starts, something exciting happens during the day, parents should make time to listen. Sharing the excitement can help ease concerns. Tune in to what your kids are talking about. "Emotionally, parents are the safe place for children to experience emotions and to help them develop the language around expressing emotions," says Bufka. "Let them generate solutions," she says. "Ask them what helps them feel better in other scary situations." Reassuring kids that they have the tools to get through the challenge ahead, because they've overcome their fears in the past, can go a long way, says Bufka. Find (and clean!) backpacks, lunch boxes, folders and other supplies. Plan ahead and get children involved in the planning process — have them get their belongs ready, etc. Often, families try to squeeze in a last fun adventure right at the end, but that can make things worse. 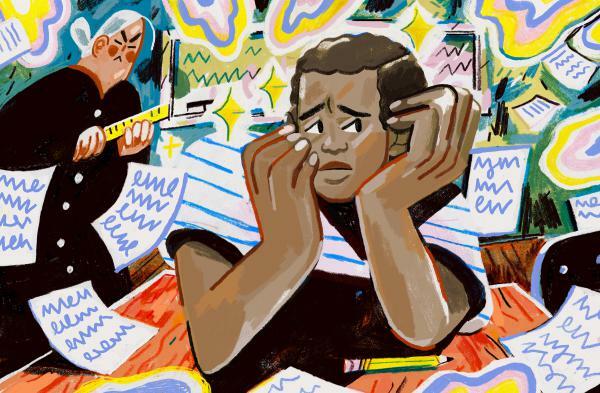 Don't wait for the night before, says John Kelly, who is also the president of the National Association of School Psychologists. "You really need to start that adjustment early." That means getting up earlier — and going to bed earlier, too. It's a great way to remind anxious kids they've been here before. Many schools are open the week before Day 1, often teachers are around, too. If the school has an orientation, don't miss it. When kids can make social connections before they start school, that's a really helpful step, says Kelly. Many kids have anxiety around friends, "Who's going to be in my class? Who can I sit with at lunch? Ride the bus with?" It's very normal for kids to have trouble for a week or two weeks into the school year. "It's all new," says Kelly. "They're restarting routines, or starting routines for the first time, and that can take a while." There are some warning signs that your child may need some extra help. Kelly ticks off a few: If you really see your child struggling, having a really difficult time just getting to school or feeling increasingly anxious at nighttime. Bufka says as a parent, you're in the best position to observe changes in their behavior. Maybe it's a bully, or your child is really overwhelmed and needs some extra work with a psychologist. Bufka says that in some cases anxiety around school can develop into school refusal, where kids flat out refuse to go. And that's definitely the time to contact a professional.